Hot on the tail of The Breaking Styrofoam Hour, this week’s Crapshoot is a special king-sized edition because we just couldn’t stop talking to XOXO conference founder Andy “waxy” Baio, possibly because he got us drunk on some really bad booze. Clever play. We pick Andy’s brain about all kinds of stuff (it helps that he’s done all kinds of stuff, not least including helping build Kickstarter, creating the interactive fiction community/toolset PlayFic, building the now-sadly-shuttered Upcoming.org, etc, etc), including the incredibly frustrating story of the legal fallout over his wonderful commissioned chiptune Miles Davis cover project, Kind of Bloop. We also talk about XOXO (videos of the talks now up!) 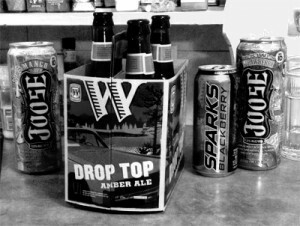 and his Creative Mornings talk, and we drink two different flavors of Joose (and one flavor of Sparks). Music this time out is a couple of excerpts from the aforementioned Kind of Bloop, So What and Freddie Freeloader.